This week I reached the grand old age of 24 and my lovely boyfriend treated me to a meal out, a book, a CD and a cuddly Moomin. 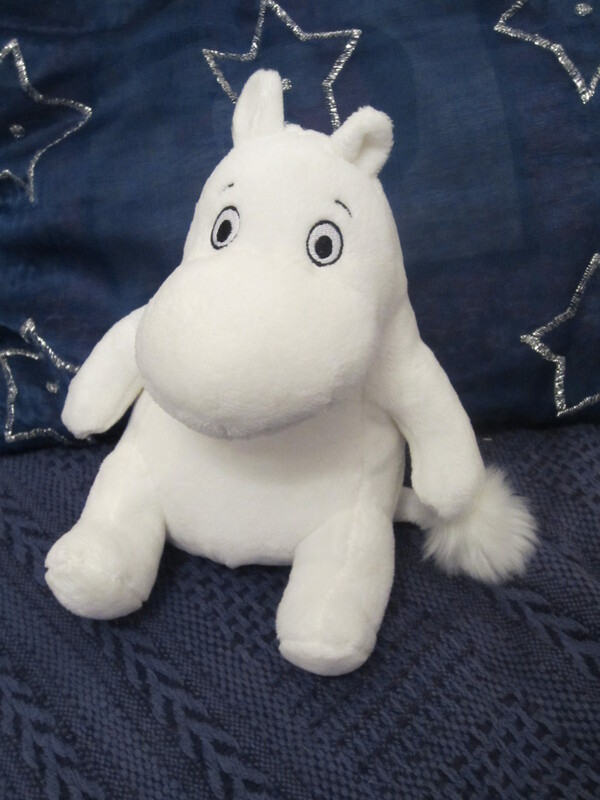 Now I know that reaching my mid-20s probably makes me too old for soft toys, but seeing this fluffy Moomintroll in the centre of a Waterstone’s display instantly transported me back to the 1990s cartoon series that I loved so much as a child. Tom claims I’m hard to buy for (I beg to differ) and sensing my inner battle over whether I could justify the purchase, he confiscated said Moomintroll and took him to the counter. He had a birthday gift quite literally in the bag and I was delighted at the prospect of soon receiving my very own Moomin, guilt-free. For those who don’t know, the Moomins are a family of small trolls with a vague resemblance to white hippopotamuses. They are gentle creatures who enjoy whistling, eating pancakes and going on adventures in the countryside around their home; the tall, blue, cylindrical Moominhouse. Amongst their friends are harmonica-playing Snufkin, fastidious Sniff and mischief-making Little My. As with the creations of Smallfilms (The Clangers, Noggin the Nog…) I feel there’s an inherent charm in the world of Moominvalley. My parents read me the original books long before I watched it on TV and it was wonderful to hear about eggshells that turned into floating clouds and a voyage to the Island of the Hattifatteners. All good stories have an element of suspense, however, and both the literary and cartoon incarnations of the Groke genuinely terrified me! The first Moomin books were created by Finnish author and artist Tove Jansson in the 1940s. Although there have been several television adaptations of her work, the one with which most people of my generation are familiar is the 1990 collaboration between Japanese, Finnish and Dutch broadcasters. It had an upbeat, memorable theme tune (surely a must for any successful kids’ TV show?) and is widely considered responsible for the subsequent ‘Moomin Boom’ which saw Moomintroll, Snufkin and Co. become one of Finland’s biggest exports. Moomin World opened in 1992 and the Finnish trolls have acquired a cult status amongst young and old fans alike. 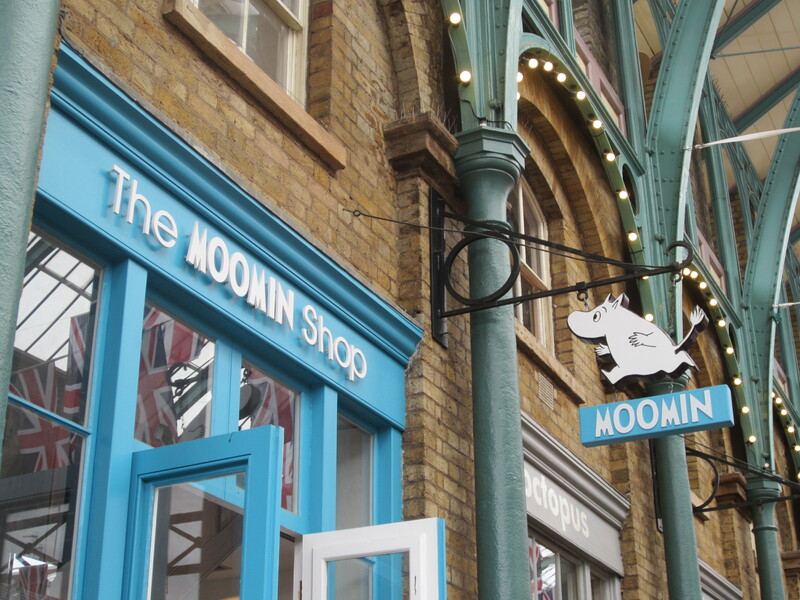 As of last autumn, there is also now a specialist Moomin Shop in Covent Garden, to which I dragged the long-suffering Tom during our first trip away together earlier this year. Whilst I greatly enjoyed browsing shelves of Moomin matches, Moomin trays, Moomin lunchboxes and every other conceivable piece of Moomin merchandise (except, coincidentally, a soft Moomintroll like the one I now own!) it was all rather overpriced and I left the shop empty handed. The fact that the Moomin franchise has become a massive commercial venture does not, however, diminish the joy I derived from reading the books and watching the cartoons when I was younger. Tove Jansson’s gentle-paced stories have enchanted generations of children and it’s testament to their timeless quality that, almost two decades after I first encountered them, I’m still delighted by her characters and their innocent adventures. Possibly my favourite Christmas present last year! 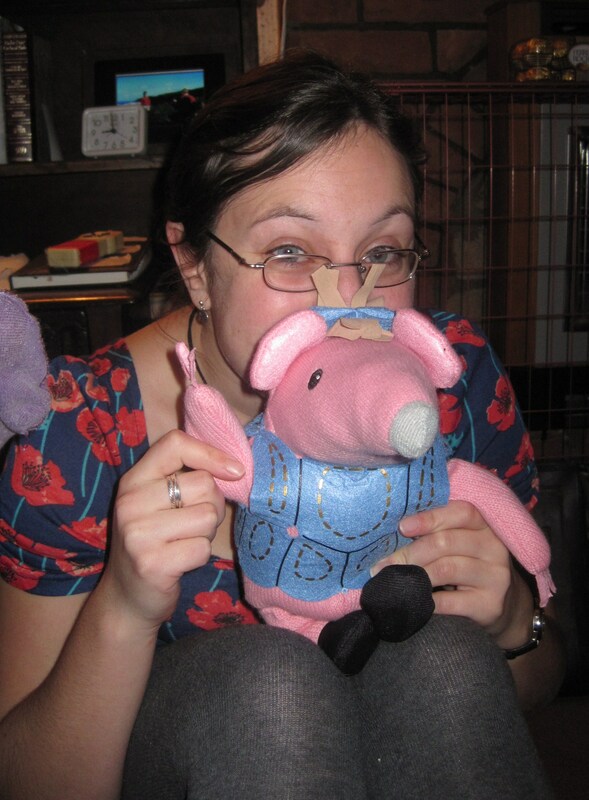 You may have noticed that my gravatar is the rather cute Tiny Clanger. The Clangers have something of a cult following now, but I find it’s quite unusual for somebody my age to be such a big fan. Although I grew up in the ‘90s and enjoyed many of the kids’ TV programmes produced in that decade, my earliest television memories are actually of shows like The Clangers that first aired in the 1960s and 1970s, made by the company Smallfilms. This is due to my parents, who would sit me down with a video of Noggin the Nog or The Clangers, so that they could revert back to their childhood whilst keeping me entertained too. Noggin was the Prince of the Nogs, whose peaceful life was sometimes disturbed by the exploits of his wicked uncle, aptly named Nogbad the Bad. The programme was loosely influenced by the Viking era and was told as a saga from the opening of each episode. My favourite character was either Grolliffe, a friendly ice dragon, or Olaf the Lofty, the court inventor whose flying machine took Noggin to distant lands with silver palm trees and magic carpets. The Clangers was, in a charming sort of way, more futuristic. Bearing in mind that it came to the screen around the time of the moon landings, it’s unsurprising that it captured the imagination of so many children. Clangers were small, woolly, mouse-like creatures, who pottered about on a small planet and dined on blue string soup. They communicated by whistling and had adventures that included growing a music tree and meeting the mysterious iron chicken. Smallfilms was a collaboration between writer Oliver Postgate and animator Peter Firmin. Their programmes remain distinctive for Postgate’s gentle narration and for the stop motion animation, which was filmed in a barn in Firmin’s garden. Other well-known Smallfilms creations were Bagpuss and Ivor the Engine, but my favourites have always been the whistling moon mice and the friendly Norseman. 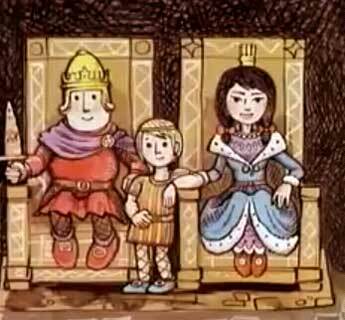 I recently re-watched some episodes of Noggin on YouTube and was surprised at how much I remembered, nearly two decades after I was first entranced by it on VHS. Both Noggin the Nog and The Clangers are now available on DVD, with the Dragons’ Friendly Society website playing a huge role in keeping these classics alive. Explosions and special effects may be few and far between, but I firmly believe that Smallfilms produced some of the best kids’ TV of the last century. The originality still shines through and there is a simple charm to them that seldom appears in childrens’ television today. The other morning the radio gently announced something about the Horrible Histories cast performing at the Proms. In my semi-dreaming state I thought I might’ve imagined it, but a quick Google search (once I was more alert) confirmed that there will, in fact, be a performance of several musical numbers from the TV series at the Royal Albert Hall this afternoon. Like many people my age, I grew up reading Terry Deary’s Horrible History books. I wasn’t sure what to expect when a friend recommended the CBBC series last year, but found I genuinely enjoyed the sketches and musical numbers that have been created for television, using Deary’s work as a basis. What’s not to like about Spartans breaking into song and dance High School Musical style? Kids love guts and gore and there’s plenty of that to be found in the past, so perhaps it’s not surprising that there have already been three series of Horrible Histories. However, it’s not every day that a show written for children, albeit by adult comedy writers, gets its best sketches showcased in six Sunday evening slots on BBC1, presented by Stephen Fry. Indeed, it seems that Horrible Histories has become something of a phenomenon. A few weeks ago myself and five fellow history graduates went to see it on stage, at the New Alexandra Theatre in Birmingham. We were definitely the oldest people there (who weren’t chaperoning our own offspring anyway!) but although it was clearly geared at a younger audience, we all came out satisfied that our £12 tickets had been well worth the money. The Ruthless Roman Army captured a Celt and took her to Rome, educating her about the brilliant and disgusting aspects of their culture along the way. A highlight of the first half was the How To Look Good Roman sketch, in which fashion tips were given to our Celtic “girlfriend” with true Gok Wan panache. During the interval everybody was given “bogglevision” glasses and there were shrieks throughout the theatre as 3D spears, floating heads and even a crocodile seemingly made their way towards the audience throughout the second half. Of course, everything was eventually resolved with a little help from Boudicca’s ghost and the Romans fled, never to attack the Celt’s farm again. As well as its transition to the stage, it’s rumoured that some of the Horrible Histories songs will soon be available on iTunes. The accompanying CBBC website is also definitely worth a look in, if only for the interactive Terrible Treasures game, where you explore four different periods of history before taking the Time Sewer Challenge. 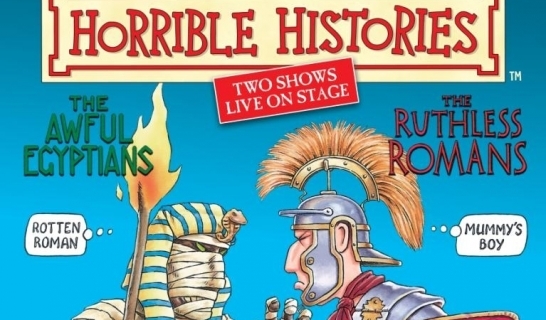 The whole Horrible Histories brand has become a full package of subtly educational entertainment, appealing to an older audience as well thanks to the comedic skill of the writing team. The next stop is the Royal Albert Hall, Series 4 is on the way and as far as I can see, the only way is up for this show and the retelling of more gruesome delights from history. If you'd like to follow my musings and get an email each time a new blog goes up then click away! Sign me up for Telly On A Plate!